The above is one of the burning questions from Azure devs, and with all other cache offerings from Microsoft Azure along with their sub categories the confusion gets multiplied on what to choose. Currently there are (and probably not for a much longer in the future) 3 types of cache services available in Azure. So what is the purpose of the other 2 cache offerings ? I blogged about the Managed Cache Service and Role based Cache some time back. (I highly recommend to read the article here before continue the reading) . The below diagram has the summary. 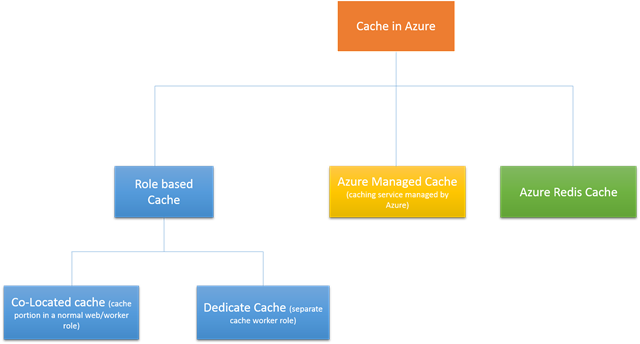 Read this blog post to get to know how to create and use Role based cache and Azure Managed Cache service. Since the Role based cache is technically a web/worker role regardless of whether it is co-located or dedicated, it is a cloud service by nature. So you create a cloud service in Visual Studio and deploy it in the cloud services, you can see and manage these roles under the cloud service section in the portal. And cloud service pricing is applied based on the role size. Role based cache templates are still available in Azure SDK 2.5 and you can create them, but not recommended. The future versions of the Azure SDK might not have the Visual Studio project template option for the Role based cache. This is the newly available feature Redis on Windows cache option. The below link has information about the usage pricing and other information about the Azure Redis Cache. Redis has got Microsoft’s backing due to which everyone is going berserk about it. I still think NCache for azure is a better option especially for enterprise applications.